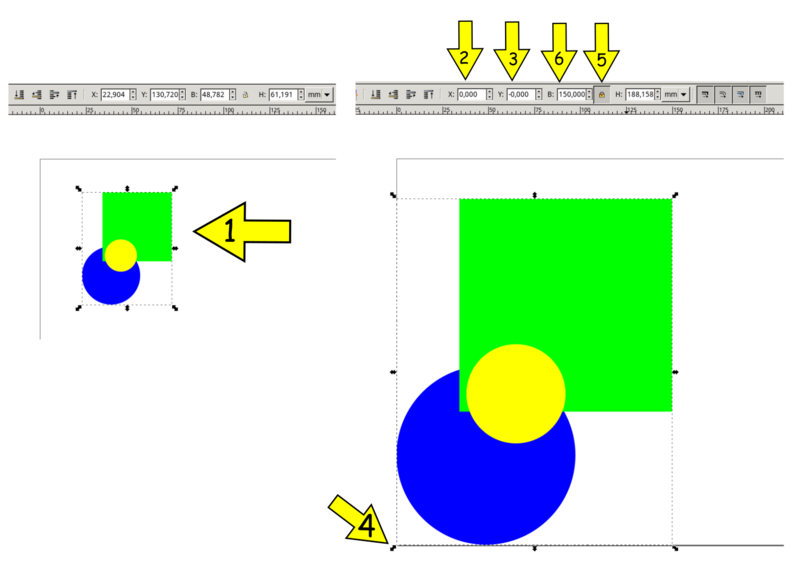 How do I resize an object in inkscape to a absolute size? I have imported a dxf in inkscape, which is now converted into several paths resembling a logo. It has no round dimensions (i.e. many decimals) as it was processed multiple times to make it. To use it in other software I want to resize it to well defined heights (e.g. 10 mm, 5 mm, 1 mm etc.) while retaining aspect ratio. When using the transformation tool, I can only resize to relative sizes, not absolute. What could I do? I guess the source of your logo is not important (dxf). You like to resize it, so first mark the whole logo and group the elements (Ctrl-G) (fig.1). Now you select X (2) and Y (3) position to 0, 0 and the group moves to point 4, the lower left point (maybe a matter of settings, but other points/directions work too). Then you mark the lock symbol, for fixing the ratio (5) and insert the width (6) value, you like (in German B as Breite, H would be height/Höhe) and work accordingly. Not the answer you're looking for? Browse other questions tagged inkscape resize or ask your own question. How do I draw a box around an object in Inkscape?